1999-04-12 Application filed by Snaptrack, Inc. filed Critical Snaptrack, Inc.
Methods and apparatuses for distributing location-based information (i.e., information specific to a client's location or a location of interest to the client) to a client, which may be a mobile SPS receiver, via the Internet and in particular, the World Wide Web. The client provides information about its location and/or a location of interest to a Web server. The Web server, based on information, provides via the Internet information relating to the client's location or location of interest to the client. The application is a continuation-in-part of U.S. Patent Application 09/067,406 entitled "Distributed Satellite Position System Processing and Application Network", filed on 4/28/98, and assigned to the assignee of the present invention. The present invention relates to processing data in a satellite positioning system (SPS), such as the Global Positioning System (GPS), and more particularly relates to methods and apparatuses for distributing location-based information that may be associated with a SPS. SPS receivers, such as those which operate in GPS or other satellite positioning systems, normally determine their position by computing relative times of arrival of signals transmitted simultaneously from a multiplicity of satellites, such as GPS, NAVSTAR, or other satellites. These satellites typically transmit, as part of their satellite data message, timing and satellite positioning data, which is sometimes referred to as "ephemeris" data. The term "ephemeris" or "satellite ephemeris" is generally used to mean a representation, such as an equation, which specifies the positions of satellites (or a satellite) over a period of time or time of day. In addition, the satellites may transmit data to indicate a reference time, such as time-of-week (TOW) information, that allows a receiver to determine unambiguously local time. Typically, an SPS receiver computes one or more "pseudorange" measurements, each of which represents the range between the receiver and a satellite vehicle (SV). The term "pseudorange" is generally used to point out that the range measurement may include error due to one or more factors, including, for example, the error between time as indicated by the clock of the SPS receiver and a reference time, such as the reference time associated with the more accurate atomic clock of the satellites. Thus, the SPS receiver typically uses the pseudoranges, along with timing and ephemeris data provided in the satellite signal to determine a more accurate set of navigational data, such as position, time, and/or range. Collecting satellite data, such as ephemeris data, provided in a satellite message requires a relatively strong received signal level in order to achieve low error rates, and may also require a relatively substantial processing time in some systems. Most GPS receivers utilize correlation methods to compute pseudoranges. These correlation methods are performed in real time, often with hardware correlators. GPS signals contain high rate repetitive signals called pseudorandom (PN) sequences. The codes available for civilian applications are called C/A codes, and have a binary phase-reversal rate, or "chipping" rate, of 1.023 MHz and a repetition period of 1023 chips for a code period of 1 msec. The code sequences belong to a family known as Gold codes. Each GPS satellite broadcasts a signal with a unique Gold code. Alternative methods, as exemplified in Patent 5,663,734, operate on snapshots of data and utilize fast convolution methods to compute the pseudoranges. All of the above systems may benefit by communicating with the resources of a remote site, or "server" utilizing a wireless communications system, such as a cellular telephone system. Such a server may provide assistance data to the mobile GPS receivers to enhance their performance, receive data from the GPS receivers and perform further processing on such data to complete or refine a position calculation, etc. In addition, the remote site may include or be connected to various display and application resources, such as a dispatching system to send emergency or repair resources to the user of the GPS mobile, or to provide route guidance or other concierge services. Thus, the above server may provide two functions: (1) Location Server functions, which provide assistance to the mobile GPS receivers to enhance their performance, and (2) Application Server functions, which display the location of the mobile GPS receiver and provide auxiliary services, such as roadside assistance. A paper was provided by Raab in 1977 on splitting the functionality of GPS processing between mobile GPS receivers and a remote basestation. See Raab, et al., "An Application of the Global Positioning System to Search and Rescue and Remote Tracking," Navigation, Vol. 24, No. 3, Fall 1977, pp. 216- 227. In one method of Raab's paper the remote GPS receiver computes the times of arrival of the satellite signals at the remote GPS receiver (so-called "pseudoranges") and transmits these times-of-arrival to a central site via a data relay where the final position calculation of the mobile is computed. Raab also mentions providing assistance information including approximate time and position to the remote unit. Raab also discusses so-called "retransmission methods" in which the raw GPS signal is relayed directly to the remote basestation. Other patents, such as U.S. Patents 4,622,557, 5,119,102, 5,379,224, and 5,420,592 discuss variations of the retransmission method. Patent 4,622,557 utilizes an analog retransmission method whereas Patents 5,119,102, 5,379,224, and 5,420,592 utilize digital means to store and then forward a digitized record of the sampled GPS signal. These patents describe communications between one or more mobile units and a single basestation which may incorporate functions of GPS calculation as well as ancillary functions described above. The U.S. Patent 4,445,118 by Taylor discusses transmission of aiding data, such as GPS satellites in view from a basestation to remote units via a communication link. In addition, in one variation, a tracking application for trucks, Taylor describes a system in which pseudorange data is sent from the trucks to the remote basestation which computes the final position. Variations on this pseudorange transfer method include Patents 5,202,829 and 5,225,842. Again, this prior art envisioned a single basestation containing GPS aiding functions as well as display and other ancillary functions. Figure 1 shows a block diagram of the prior art which utilizes a basestation to supplement GPS signal processing. Mobile units 12a, 12b, 12c, and 12d in this example contain a combination of a GPS receiver and a wireless modem. Attached to the GPS unit are GPS antennas 10a, 10b, 10c, and lOd for receiving GPS signals from GPS satellites (not shown for simplicity) and antennas 1 la, 1 lb, 1 lc, and 1 Id for communication to and from a basestation 20 which includes a basestation antenna 17. In some implementations, this communication may be in one direction only. GPS receiver and GPS antenna in order to determine its own position and provide differential corrections to the data transmitted to it from the mobile GPS units. Basestation 9 also includes a display 14 and computer equipment which is coupled to the signal processing unit 15 by a connection 16 and which allows an operator to visually track the position of the mobiles and provide manual and semiautomatic commands to these units via the aforementioned communications links. In some cases, unit 14 together with signal processing unit 15 is termed a "workstation." Although Figure 1 shows a wireless link from each mobile GPS unit to the basestation, this link may actually be a wireless link to a modem, such as one at a cell site followed by a wired or other link to the basestation as shown in Figure 1. In some implementations, the basestation 9 may actually represent a number of basestations in a reference network. Unfortunately, in distributed systems, such as the one shown in Figure 1, the geographical area in which a mobile unit may operate in conjunction with the basestation(s) is generally limited, for example, by the range and distribution of cellular or other communication system transceivers. As such, a mobile GPS unit may not be able to communicate effectively outside of the range provided by the basestation(s), and/or may experience delays in attempting such communication. Therefore, what is need is an improved method and system for distribution of satellite signal-related and/or location-specific information. Figure 1 shows a prior art GPS tracking system. Figure 2A illustrates an example of a distributed processing system using GPS information, according to one embodiment of the present invention. Figure 2B shows another example of a distributed processing system using GPS information, according to one embodiment of the present invention. Figure 3 illustrates an implementation of a location server system, according to one embodiment of the invention. Figure 4 depicts an example of a combined GPS receiver and communication system, according to one embodiment of the present invention. Figure 5 illustrates an example of a GPS reference station, according to one embodiment of the invention. Figure 6 shows an example of a distributed system for processing GPS information in a "911 " situation. Figure 7 shows an example of a distributed system for processing GPS information for a location-based service. Figure 8 is a flowchart which describes a method for using a distributed processing system to process GPS information in a "911" situation. Figure 9 is a block diagram of a system for exchanging location-based information via a computer network, such as the Internet, according to one embodiment of the invention. Figure 10 is a block diagram of one example of a system architecture for providing location-based information via the Internet, according to one embodiment of the invention. Figure 11 is a flow diagram of a method for World-Wide Web distribution of location based information, according to one embodiment of the invention. The present invention relates to a distributed processing system for processing GPS information. The following description and drawings are illustrative of the invention and are not to be construed as limiting the invention. Numerous specific details are described to provide a thorough understanding of the present invention. However, in certain instances, well known or conventional details are not described in order to not unnecessarily obscure the present invention. Figure 2A is a block diagram which shows an exemplary architecture for a distributed processing system, according to one embodiment of the invention. This architecture includes cells 20a, 20b, and 20c, each of which includes its respective wireless cell based station ("cell basestation"). Thus, cell basestation 37a performs wireless communications to and from mobile GPS receivers la, lb, lc, and Id, each of which includes a wireless communication system, in the cell 20a. Similarly, cell basestation 37b in cell 20b provides 2-way wireless communications with mobile GPS receivers 2a, 2b, 2c, and 2d, each of which includes a wireless communication system such as a cell telephone. The cell 20c includes mobile GPS receivers 3a, 3b, 3c, and 3d which are capable of performing 2-way wireless communications with the cell basestation 37c. It will be understood that in certain embodiments of the invention, some mobile GPS receivers may be capable of only 1-way communications (transmissions to the basestation) wherein the mobile GPS unit determines its position (by determining pseudoranges and reading transmissions of satellite ephemeris data) and transmits the position to an application server. Each cell basestation includes a respective connection (e.g. connections 21a, 21b, or 21c) from the basestation to a communication infrastructure 40. A. Mobile GPS units (e.g. unit la) communicating information to and from wireless basestations using a wireless type communications system. lines, satellites, etc.) which in turn can communicate with the wireless basestations (e.g. station 37a). C . Separate application servers (e.g. servers 22 or 23) that can display the results of location information supplied by the location servers and permit auxiliary services, such as dispatching, to be performed. D. WWW servers (e.g., WWW servers 19a or 19b) that can provide location-based information (i.e., information related to a client's location or another location, which, for example, may be of interest to the client) to a client, which may be a mobile GPS unit (e.g., unit la). E . A communication infrastructure 40 which may include a public switched telephone network and/or a dedicated network, such as a packet switched data network. F . Separate GPS reference receivers (e.g. GPS reference stations 24a or 24b), which can measure ranging information from the GPS satellites over a wide geographical area and receive and process their navigation message data. In general, all of these network elements can communicate with one another as seen in Figure 2A. However, in preferred embodiments, the GPS reference receivers communicate with the location servers and the location servers communicate mainly with the application servers and with the WWW servers. An aspect of the current invention is the separation of the location servers, as exemplified by 32 and 33, from the application servers 22 and 23. It should be appreciated that the location servers themselves may only consist of software components that are resident on other processing systems attached to the wireless network. Such processing systems may perform other functions such as voice and data messaging and WWW services. The location server software then may utilize existing computational components associated with these services and not utilize a processor solely for its own use. In other configurations, the location server may consist of an embedded circuit board in a multiprocessor computer. This configuration may ensure a desired throughput capability of the server. In preferred embodiments, the location server is autonomous and has no display or operator interaction functions, other than those required for occasional fault testing. In Figure 2A, location server 33 is physically located within the same cell site as the mobile units in cell 20b. Server 32, however, is not located within any of the cells shown, but can service the data from cells 20a, 20b and 20c. In fact, even server 33 could process data from cells 20a and 20c, although server 32 may be preferred for this task due to its geographical proximity. Utilizing a network of servers as shown in Figure 2A provides reliability and redundancy which is important in emergency response applications. Furthermore, in emergency response applications there may be a flood of calls for service, which could overload a star-based system such as in Figure 1. The network approach of Figure 2A overcomes these bottlenecks. In another embodiment, the WWW server may act as a proxy server for an application server. In such capacity, the WWW server acts as an entry point for information to be relayed to and from the application server. the mobile is making its measurements. Since the satellites are moving rapidly, this erroneous position of the GPS satellites translates to an error in the position calculation of the mobile, when this calculation is done at the basestation. One solution to this problem is to locate the location server in proximity to the mobiles, e.g. at a switching center (termed a Mobile Switching Center, MSC). Thus, the path delay from the mobile to the location server may be short, as compared to a single basestation which may be located thousands of miles away. In a CDMA wireless network configuration, for example, a CDMA signal may be used to provide time coordination between the mobile unit and the basestation. Another example of the utility of the architecture of Figure 2A is in applications for emergency response, such as wireless 911 capability. In such applications the application servers of Figure 2A are termed Public Safety Answering Points (PSAP's) and may be numerous in number when servicing a metropolitan area. A location server, such as server 32, would in this case service a number of cell sites and route location data to such PSAP's. Additional Application Servers may be utilized in such a situation to act as an intermediary between the location server and the PSAP's. For example, such application servers may perform the latitude/longitude to street address transformation. Hence, in this application there may be two classes of application servers. The redundancy and distribution of the location and application servers in this case provide much greater reliability than would be possible with the star topology of the prior art of Figure 1. Within each cell, such as the cell 102, there is a wireless cell basestation (or base) such as cell basestation 102a which is designed to communicate through a wireless communication medium with a communication receiver which may be combined with a mobile GPS receiver to provide a combined system such as the receiver 102b shown in Figure 2B. An example of such a combined system having a GPS receiver and a communication system is shown in Figure 4 and may include both a GPS antenna 77 and a communication system antenna 79. Each cell site is coupled to a mobile switching center. In Figure 2B, cell bases 102a and 103a are coupled to switching center 105 through connections 102c and 103c respectively, and cell base 104a is coupled to a different mobile switching center 106 through connection 104c. These connections are typically wire line connections between the respective cell base and the mobile switching centers 105 and 106. Each cell base includes an antenna for communicating with communication systems serviced by the cell site. In one example, the cell site may be a cellular telephone cell site which communicates with mobile cellular telephones in the area serviced by the cell site. In the example of Figure 2B, each mobile switching center (MSC) may be coupled to at least one regional short message service center (SMSC) through a communication network 115 which in one embodiment is referred to as a Signaling System Number 7 (SS7) Network. This network is designed to allow short messages (e.g. control information and data) to be passed among elements of the telephone network. It will be understood that Figure 2B shows one example and that it is possible for several MSC's to be coupled to one regional SMSC. Alternatively, other communication networks may be used, and gateway interfaces in the network may be used to interconnect the MSC's to various GPS location servers. The example of Figure 2B also shows two GPS location servers 109 and 110 which are respectively coupled to regional SMSC 107 and regional SMSC 108 and to the mobile switching centers 105 and 106 through the communications network 115. In one embodiment of the distributed system of Figure 2B, the connections 107a and 108a are part of a permanent communication network which interconnects various MSC's and regional SMSC's with various GPS location servers. This allows each regional SMSC to act as a router to route requests for location services to whichever GPS location servers are available in case of congestion at a location server or failure of a location server. Thus, regional SMSC 107 may route location service requests from mobile GPS receiver 102b (e.g. the user of mobile GPS receiver 102b dials 911 on the integrated cell telephone) to the GPS location server 110 if location server 109 is congested or has failed or is otherwise unable to service the location service request. While an SS7 network and a PSTN network are shown in Figure 2B as examples of communication networks which are used to interconnect various components of the overall system, it will be appreciated that these networks may use any of a number of different types of networks and may in fact be one network (e.g. networks 115 and 112 are combined together as one network such as the PSTN). Each network may be a circuit switched data network or a digital packet switched data network. Each network may include gateway interfaces which interface between the various components coupled to the network. In one example of the embodiment of Figure 2B, each SMSC operates as a gateway interface. network of GPS reference stations, shown as GPS reference network 111, is typically coupled to each GPS location server through a data network. The data network which supplies data from the network of GPS reference stations may be part of the communication network 112 or communication network 115 or may be a separate data network having connections 109 A and 110A as shown in Figure 2B. Hence, location server 109 receives data from the network 111 through connection 109a and server 110 receives data from network 111 through connection 110a. As shown in Figure 2B, each GPS location server is also coupled to another communication network 112, such as a public switched telephone network (PSTN) to which two application servers 114 and 116 are coupled. Either of the two GPS location servers may be used, in one embodiment, to determine the position of a mobile GPS receiver (e.g. receiver 102b) using GPS signals received by the mobile GPS receiver. It should be noted that a cellular based or cell based wireless communication system is a communication system which has more than one transmitter, each of which serves a different geographical area, which is predefined at any instant in time. Typically, each transmitter is a wireless transmitter which serves a cell which has a geographical radius of less than 20 miles, although the area covered depends on the particular communication system. There are numerous types of cell-based communication systems, such as cellular telephones, PCS (personal communication system), SMR (specialized mobile radio), one-way and two-way pager systems, RAM, ARDIS, and wireless packet data systems. Typically, the predefined geographical areas are referred to as cells and a plurality of cells are grouped together into a cellular service area and these pluralities of cells are coupled to one or more cellular switching centers which provide connections to land-based telephone systems and/or networks. A service area is often used for billing purposes. Hence, it may be the case that cells in more than one service area are connected to one switching center. Alternatively, it is sometimes the case that cells within one service area are connected to different switching centers, especially in dense population areas. In general, a service area is defined as a collection of cells within close geographical proximity to one another. Another class of cell-based systems that fits the above description is satellite based, where the cellular basestations or cell sites are satellites that typically orbit the earth. In these systems, the cell sectors and service areas move as a function of time. Examples of such systems include Iridium, Globalstar, Orbcomm, and Odyssey. the server 50 of Figure 3. Thus the network 60 may be considered to include the mobile switching centers 105 and 106 and the cells 102, 103, and 104. The network 64 may be considered to include the Applications Servers 114 and 116, which are each usually computer systems with communication interfaces, and also may include one or more "PSAP's," (Public Safety Answering Point) which is typically the control center which answers 911 emergency telephone calls. The network 62, which represents the GPS reference network 111 of Figure 2B, is a network of GPS receivers which are GPS reference receivers designed to provide differential GPS correction information and also to provide GPS signal data including the satellite ephemeris data to the data processing unit. When the server 50 serves a very large geographical area or provides redundant backup to other location servers which are very remote from it, a local optional GPS receiver, such as optional GPS receiver 56, may not be able to observe all GPS satellites that are in view of mobile SPS receivers throughout this area. Accordingly, the network 62 collects and provides satellite ephemeris data (typically as part of the entire raw satellite navigation message) and differential GPS correction data over a wide area in accordance with the present invention. As shown in Figure 3, a mass storage device 55 is coupled to the data processing unit 51. Typically, the mass storage 55 will include storage for software for performing the GPS position calculations after receiving pseudoranges from the mobile GPS receivers, such as a receiver 102b of Figure 2B. These pseudoranges are normally received through the cell site and mobile switching center and the modem or other interface 53. Alternatively, this storage can be used to provide differential corrections to position calculations provided by the mobile GPS receivers. The mass storage device 55 also includes software, at least in one embodiment, which is used to receive and use the satellite ephemeris data (typically as part of the entire raw satellite navigation message) provided by the GPS reference network 32 through the modem or other interface 54.
may be used in a conventional manner with the pseudoranges obtained from the mobile GPS receiver in order to compute the position information for the mobile GPS receiver. The interfaces 52, 53, and 54 may each be a modem or other suitable communication interface for coupling the data processing unit to other computer systems, as in the case of network 64, and to cellular based communication systems, as in the case of network 60, and to transmitting devices, such as computer systems in the network 62. In one embodiment, it will be appreciated that the network 62 includes a dispersed collection of GPS reference receivers dispersed over a geographical region. In some embodiments, the differential correction GPS information, obtained from a receiver 56 near the cell site or cellular service area which is communicating with the mobile GPS receiver through the cellular based communication system, will provide differential GPS correction information which is appropriate for the approximate location of the mobile GPS receiver. In other cases, differential corrections from the network 62 may be combined to compute a differential correction appropriate to the location of the mobile GPS receiver. In one embodiment, the GPS receiver 56 is operable to provide raw satellite navigation message information (e.g., received at 50 bps) and timing information in a form of 1 (one) PPS output. in the art. For example, U.S. Patent 5, 663,734 describes an example of a combined GPS receiver and communication system which utilizes an improved GPS receiver system. Another example of a combined GPS and communication system has been described in co-pending Application Serial No. 08/652,833, which was filed May 23, 1996. The system 75 of Figure 4, as well as numerous alternative communication systems having SPS receivers, may be employed with the methods of the present invention to operate with the computer network of the present invention. Figure 5 shows one embodiment for a GPS reference station. It will be appreciated that each reference station may be constructed in this way and coupled to the communication network or medium. Typically, each GPS reference station, such as GPS reference station 90 of Figure 5, will include a dual frequency GPS reference receiver 92 which is coupled to a GPS antenna 91 which receives GPS signals from GPS satellites in view of the antenna 91. GPS reference receivers are well known in the art. The GPS reference receiver 92, according to one embodiment of the present invention, provides at least two types of information as outputs from the receiver 92. Satellite measurement outputs 93 (such as pseudoranges and/or range-rates) are provided to a processor and network interface 95, and these satellite measurement outputs are used to compute pseudorange and/or range-rate differential corrections in the conventional manner for those satellites in view of the GPS antenna 91. The processor and network interface 95 may be a conventional digital computer system which has interfaces for receiving data from a GPS reference receiver as is well known in the art. The processor 95 will typically include software designed to process the pseudorange data to determine the appropriate pseudorange correction for each satellite in view of the GPS antenna 91. These pseudorange corrections are then transmitted through the network interface to the communication network or medium 96 to which other GPS reference stations are typically also coupled. The GPS reference receiver 92 also provides a satellite ephemeris data output 94. This data is provided to the processor and network interface 95 which then transmits this data onto the communication network 96, which is included in the GPS reference network 111 of Figure 2B. received from each GPS satellite. This satellite ephemeris data is part of the navigation message which is broadcast as the 50 bit per second data stream in the GPS signals from the GPS satellites and is described in great detail in the GPS ICD-200 document. The processor and network interface 95 receives this satellite ephemeris data output 94 and transmits it in real time or near real time to the communication network 96. As will be described below, this satellite ephemeris data which is transmitted into the communication network is later received through the network at various GPS location servers according to aspects of the present invention. In certain embodiments of the present invention, only certain segments of the navigation message, such as the satellite ephemeris data message may be sent to location servers in order to lower the bandwidth requirements for the network interfaces and for the communication network. Typically, this data may not need to be provided continuously. For example, only the first three frames which contain ephemeris information rather than all 5 frames together may be transmitted on a regular basis into the communication network 96. It will be appreciated that in one embodiment of the present invention, the location server may receive the entire navigation message which is transmitted from one or more GPS reference receivers into the network in order to perform a method for measuring time related to satellite data messages, such as the method described in co-pending U.S. Patent Application Serial No. 08/794,649, which was filed February 3, 1997, by Norman F. Krasner. As used herein, the term "satellite ephemeris data" includes data which is only a portion of the satellite navigation message (e.g. 50 baud message) transmitted by a GPS satellite or at least a mathematical representation of this satellite ephemeris data. For example, the term satellite ephemeris data refers to at least a representation of a portion of the 50 baud data message encoded into the GPS signal transmitted from a GPS satellite. It will be also understood that the GPS reference receiver 92 decoded the different GPS signals from the different GPS satellites in view of the reference receiver 92 in order to provide the binary data output 94 which contains the satellite ephemeris data. network achieves prescribed throughput, reliability, latency, node and subscriber management functions. It should be adaptable and allow for growth in the number of nodes and allow for user authentication and network health monitoring. Many of these requirements are either absent or are more simply provided in a single localized processing system, which is the current state of the art. The distributed architecture is designed to utilize a combination of existing data communication technologies between the network nodes of the distributed system including the mobile GPS unit. The architecture does not preclude the use of future communication systems and protocols as they become available. The distributed architecture is adaptable to allow different system functionality as required by a particular use. Technology specific information may be encoded in the messaging protocols and this information is used to specify different system functionality. For example, the technology specific information may include the type of location service (e.g. emergency 911 vs. concierge service), the type of radio technology (e.g. CDMA), the type or vendor of the mobile unit, the base station's address, and/or the server vendor. This information is used to control how the distributed architecture of the present invention functions. For example, information concerning the type of location service will typically determine its processing and routing priority; location processing of emergency 911 calls will typically receive highest priority at a location server relative to location processing of other location processing requests such as concierge services. Similarly, the 911 calls will typically also be routed at the fastest possible rate through the network of the distributed architecture by labeling data for such calls as 911 call type of location service in order to route such data as high (e.g. the highest) priority data to be transmitted and switched through the network as quickly as possible. message passing mechanisms or packet data protocols, let alone a distributed message passing system. The functioning of the system requires the passing of messages between the mobile GPS unit and the Location Server to perform part of the positioning operation. Depending on the application, the exchange of messages can be initiated by either entity. The messages are defined at a high level (application layer) such that they are abstracted from the underlying communication system as much as possible. Hence, a number of communication systems can be supported by this interface. HDTP (Wireless Application Forum transport protocol) This list is not complete and exhaustive so other communications systems are possible. The application level messaging can be supported in a connection oriented or connectionless communication system. The above description does not dictate a direct communication path between the mobile GPS unit and the location server; in fact, there may be intermediate nodes which may in addition perform protocol conversion. For example, the mobile GPS unit may communicate with a Mobile Switching Center (MSC) via a basestation sub-system, and a separate communication then occurs between the MSC and the location server. systems used to transport them. The communication between the location server and the application server can be connection-oriented or connectionless. For connection-oriented communication the connection may be made for each transaction or group of related transactions or it may be a permanent connection; this will be dictated by the requirements of the applications. This list is not exhaustive and does not preclude other protocols or transport mechanism. In one particular embodiment, data is transmitted between processing units on the network by packetizing data into separate packets. A transmitting unit, such as a location server, will determine how to packetize its original data and then transmit it through the network to an application server (which can then display the position of a mobile GPS receiver). This application server receiving the packets of data re-assembles the original data from the received packets. In one embodiment, the location servers interconnect with a single reference receiver or a wide area network of reference receivers using methods as defined above. The addressing scheme used for setting up communication between network nodes is constrained by the communication system used. The network communication systems may utilize address translation transparently to the network nodes described here or the network nodes themselves may be responsible for address translation and selection of node addresses. For security, capacity and redundancy reasons the architecture supports multiple routes for communication. This may be managed by the communication system such that it is transparent to the network node, or this may be the responsibility of the network node. The network topology, the network nodes and the communication systems used are designed such that latency is kept within acceptable limits to provide the required performance to the location application. Where appropriate (e.g. emergency calls such as 911 calls) positioning transactions can be allocated a high priority and processed accordingly to reduce latency in providing a location. The required level of fault tolerance and redundancy in network elements will be dictated by a number of factors according to the location-based application and such factors as economics and regulatory requirements. The architecture is flexible such that a number of approaches can be used to meet these requirements. The location server and application server are mainly software functions that are executed on computers within this network. A number of techniques are compatible with these elements to aid reliability, including fault tolerant computers, high availability systems and the use of redundant systems. For the latter case, several configurations are envisaged for management of redundancy such as master/slave, load-shared pair with mutual monitoring and multiple systems with voting. The network nodes of the architecture are capable of being managed by a remote network management system which can itself be distributed or centralized. The network management system allows the remote control and configuration of network nodes in the distributed location-based application network. The application servers and, for some services, the location servers, can be managed with respect to service features from a remote service management system which can itself be distributed or centralized. The service management system is used to configure application data, perform subscriber management and support external information systems related to the applications. number via the connection 170 from the PSAP 173. The location database server 166 then correlates the location determined by the location server with the user's name (the user/owner of the mobile GPS receiver 151 which initiated the location request) and provides the user name and location over the connection 169 to the PSAP 173. The operation of the system 150 shown in Figure 6 will be further described below in conjunction with Figure 8. Figure 7 shows an alternative example of a distributed location-based processing system. In this case, the location server performs services which may not be considered emergency services, such as E911 emergency services. For example, the location server 214 may perform dispatching services or concierge services for a user of the mobile GPS receiver 203. For example, the user of the mobile GPS receiver 203 may desire to know the location of three of the closest Italian restaurants and may place a call to the operators at the location server 214. The voice call is forwarded through the basestation 205 and the mobile switching center 207 through the PSTN 211 to the location-based application server 214. At the same time, the GPS location server 225 determines the location of the mobile GPS receiver 203 through the SS7 network 219 by transmitting short messages between the mobile GPS receiver 203 and the GPS location receiver 225. In this case, the messages are transmitted through the mobile switching center 207 and the SS7 network 219 and the regional SMSC 217 and the packet switched data network 227. In the example shown in Figure 7, the GPS reference receiver network 165 is coupled to the network 227 to provide the satellite ephemeris data for the GPS location server. The database 221 which may be a database server, which is coupled to the SS7 network 219, performs call routing services. In this example, the user of the receiver 203 may dial a "1-800" phone number (in the United States) to access the location-based application server. It will be appreciated that for both systems shown in Figures 6 and 7, additional location servers may be coupled to the data network and additional application servers may be coupled to communication networks in the same manner as shown in Figure 2B or Figure 2A. and then sends this information to a location database server and then to a PSAP which displays the position of the mobile unit on a map. Figure 9 is a block diagram of a system for exchanging location-based information via a computer network, such as the Internet, according to one embodiment of the invention. A system 400 is shown, in which a location-based information Web server 404 is part of the Internet 402. The Intemet generally represents a network of networks, and may include various types of data communication media (wires, wireless, cellular, etc. ), switching devices, routing devices, network computers/servers, client computer systems, local area networks (LANs), wide area networks (WANs), etc. Such networks may use a variety of protocols to regulate the exchange of information, such as TCP/IP, ATM, etc. Intemet access is typically granted to client computer systems by Intemet service providers (ISPs). Access to the Internet may facilitate transfer of various types of information (e.g., email, data files, programs, media, etc.) between two or more digital processing systems. The World-Wide Web (WWW), as the name implies, is a global network or "web" of systems and applications that provide relatively flexible utilization of the Internet for exchanging information. In a sense, the World-Wide Web represents an application of the Intemet to combine ease-of-use with widespread connectivity and substantially universal access to the Intemet and its resources. As such, a data processing system may connect to the Intemet (e.g., through an ISP, a LAN gateway, etc.) at virtually any location and access global information and services provided through the World-Wide Web. Data exchange on the Intemet typically uses TCP/IP protocols, and the WWW typically supports hypertext markup language (HTML) documents. location server, application server, wide area reference network management server, etc. The operation of the system 400 is now described according to one embodiment of the invention. A client, such as the client 408 shown in Figure 9, may establish data communication with the Intemet, and in particular, with the server 404, via a data communication interface 406, which enables Intemet access, to obtain location-based information (i.e., information pertinent to a specific position or geographical area, typically corresponding to the location of the client 408). In one embodiment, the client 408 represents a mobile SPS unit, which may include an SPS receiver and a communication transceiver, and thus, may provide GPS measurements (e.g., pseudoranges) to the server 404. However, it will be appreciated that other client systems, which may not necessarily include SPS circuitry, may also access the server 404 to obtain location-based information therefrom. As such, a user may know and enter a geographical position/area of interest to access the location-based service and/or GPS signal-related information. The data communication interface represents one or combination of systems, media, and applications for providing Intemet access to the client 408. As an example, the data communication interface 406 may represent a cellular, PSTN, digital circuit-switched, and/or packet-switched network that serves as a communication gateway through which the client 408 may establish connection to the Internet, and in particular, the server 404. Typically, the client 408 includes or is coupled to a modem and/or other communication interface. For example, the client 408 may include a wireless (e.g., cellular) or hard-wired (e.g., PBX) communication interface to enable the client unit to establish connection to the Intemet. On the other hand, the client 408 may include a network interface (e.g., an Ethernet card) to establish connection with the Intemet, for example, through a LAN gateway or other interface. Table 1 shows some examples of the information that may be provided to the client 408 by the server 404 via the Intemet, according to one embodiment of the invention. The first column shows some examples of location-based service information that may be made available to the client 408 via the Intemet and the World-Wide Web. On the other hand, the second column shows some of the SPS-related information that may be made available to the client 408. One or both types of information may be provided to the client via the server. The information shown in Table 1 may be obtained by the server 404 via one or more GPS reference stations, a wide area reference network (WARN) of reference stations, weather/news databases, registration by certain Web sites, databases, businesses, etc. Typically, most of the SPS-related information is also tailored for the geographic area or position associated with the client, i.e., the SPS-related information is also location-based. At least a portion of the information shown in Table 1 may also be tagged with time, which, in the case of GPS, may be GPS time or derived from GPS time, and provided to the client as such. It will be appreciated that a subset of the information may be available in certain areas, times, implementations, etc. Furthermore, it will be appreciated that other types of location-based service information and/or SPS-related information may be provided in alternative embodiments of the invention. Figure 10 is a block diagram of one example of a system architecture for providing location-based information via the Intemet, according to one embodiment of the invention. The system 501 is similar to the system 101 shown in Figure 2B, except that the system 501 includes a web server 118 to provide location-based information to mobile GPS units and/or other client devices through the Intemet, and in particular, the World-Wide Web. displayed on a map) to a user of the application server. Normally, the GPS location server calculates but does not present (e.g. by display) the position at the GPS location server. An application server may send a request, for the position of a particular GPS receiver in one of the cells, to a GPS location server which then initiates a conversation with a particular mobile GPS receiver through the mobile switching center in order to determine or refine the position of the GPS receiver and report that position back to the particular application. In another embodiment, a position determination for a GPS receiver may be initiated by a user of a mobile GPS receiver; for example, the user of the mobile GPS receiver may press 911 on the cell phone to indicate an emergency situation at the location of the mobile GPS receiver and this may initiate a location process in the manner described herein; or the user may simply request a position fix from the network. In addition, in accordance with one embodiment of the invention, location- based information, such as the information shown above in Table 1, may be provided to mobile GPS receivers and/or other clients by the Web server 118, which is shown coupled to the communication network 112. The communication network 112 represents one or a combination of various types of communication networks (e.g., PSTN, packet switched, etc.) through which a mobile GPS receiver or other client device can access the Web server 118, and the location- based information provided by the Web server 118 through the World-Wide Web. Thus, the communication network 112 may represent or be coupled to the Intemet, and in particular, the World-Wide Web. The Web server 118 may obtain GPS- related information (e.g., ephemeris data, raw satellite navigational data message(s), almanac data, differential correction data, etc.) from the GPS reference network 111 and/or the location servers 109 and 110. The Web server 118 may also provide information about a client's location to the location servers, application servers, or other devices that may be coupled to or may access the Web server 118.
laptop computer, smart phone, etc., which may enable a user to input known estimated location and/or time information, or a mobile GPS receiver or GPS receiver integrated with a client device which also includes a modem to enable the client unit to login to the Web server 118, for example, through the World-Wide Web. Such access may be obtained through a wired (e.g., PSTN) and/or wireless (e.g., cellular) network or Quicknet interface and an Intemet Service Provider (ISP) or a direct-dial-in to the Web server 118. As such, the client unit 119 may provide information associated with its location (e.g., pseudorange measurement, raw satellite navigational message(s), user provided location information, etc.) to the Web server 118. In response, the server web server 118 provides the client via the World-Wide Web location-based information/service, such as those shown in Table 1 above. For example, the Web server 118 may provide the client unit 119 with satellite ephemeris information, differential time/position correction information, etc., associated with its location or location of interest. In addition to such GPS-related navigational information, the Web server 118 may also provide location-specific services, such as weather, traffic, geographically-targeted commerce/advertising opportunity, etc. In one embodiment, the Web server 118 (which may operate in conjunction with another server/device coupled thereto) may use the location of the mobile GPS receiver to derive representations (e.g., charts, graphs, etc.) of cellular use demographics, such as time and place of calls, location-based and/or time-based distributions, etc., which representations and data may be provided to cellular carriers (e.g., for network capacity analysis and design), government agencies, Web users, etc. Furthermore, the Web server 118 may display (e.g., on a map) the location of various mobile GPS clients with or without integrated receivers with or without time tags. Such information may be useful for advertising, customer/user profiles, location-targeted marketing, location-based billing, etc. Furthermore, mobile GPS receivers, desktop/portable computers, or other client units may be able to access through the World-Wide Web the location- based information provided by the Web server 118.
navigation messages, information about a particular cellular site serving the mobile GPS receiver, etc. ), and provide data indicating the position to the mobile GPS receiver. On the other hand, the mobile GPS receiver may receive data from the Web server 118 to aid the mobile GPS receiver itself to determine its position and/or other navigational information. In another embodiment, the Web server 118 may be an additional process running on the GPS location server or application server. Figure 11 is a flow diagram of a method for World-Wide Web distribution of location-based information, according to one embodiment of the invention. At 602, a client (e.g., a digital processing system, a mobile GPS receiver, etc.) establishes connection to the Intemet, and in particular, the World-Wide Web, to access a location-based information Web server, such as the Web server 118. For example, the client may access the Web server through a browser program which enables processing Web documents/sites by entering a domain name for the Web server, such as "www.snaptrack.com." At 604, the client provides information indicative of its location and/or other location of interest to the Web server. For example, the Web server may provide a Web page which includes "fill-in" forms to enter values to indicate the position of the client and/or request an upload of GPS-related measurements, data, etc., such as pseudoranges, raw (digitized) satellite navigation messages, etc., to the Web server. In addition, it will be appreciated that the client may indirectly provide information about its location to the Web server. For example, the Web server or other device may determine information about the location of the client based on location or other characteristic of the interface through which the client has established communication with the Web server (e.g., a particular cell site location, a particular phone number, etc.). tum, use such information to determine navigational information (e.g., its position, velocity, time, etc.). Additionally, the Web server may provide location- specific services to the client, such as location-based traffic information, weather/terrain information, emergency dispatch, advertising for (local) businesses, opportunity for electronic commerce, reservation services (for local hotels, restaurants, etc. ), routing/map information, etc. At 608, the Web server may optionally use the information about the client, such as its location, time of log-on/call, etc., in various applications or provide the information to other systems applications. For example, as described above, the Web server and/or other device in communication therewith may use the location of the client to derive representations (e.g., charts, graphs, etc.) of cellular use demographics, such as time and place of calls, location-based and/or time-based distributions, etc., which representations and data may be provided to cellular carriers, government agencies, Web users, etc. Furthermore, the Web server may display (e.g., on a map) the location of various mobile GPS receivers/users with or without time tags. Such information may be useful for advertising, customer/user profiles, location-targeted marketing, etc. Furthermore, mobile GPS receivers, desktop/portable computers, or other clients may be able to access through the World-Wide Web the information about the client and/or other clients. Furthermore, a system receiving location-based information may use this information to decide if a particular service is allowed at the client's present location and/or time (and/or a location or time of interest). Figure 12 is a diagram of a system configuration for providing a location- based emergency call routing application, according to one embodiment of the invention. It will be appreciated that the devices and/or applications shown in Figure 12 may be linked by communication media that is hard- wired, wireless, or combination thereof. As shown, a mobile unit 702, which is typically a "location- enabled" mobile unit, may provide a mobile identification number (MIN) and pseudoranges (PR) to a basestation 704, and in turn receive satellite vehicle (SV) information via the basestation 704. A mobile switching center 706 is linked to the basestation 704.
provide information associated with the location of the mobile unit 702 to a 911 selective router 712. The SPS location server may be linked to a GPS reference network 720 and the mobile switching center 706 through a communication network 708. The selective router 712, in turn, uses the location information to route the voice calls. A service control point (SCP) 714, linked to an SS7 network 710, provides the information associated with the mobile unit (e.g., the MLN, location information such as longitude/latitude, etc.) to an automatic number and location identifier (ANI/ALI) database 716. The ANI/ALI database may be accessed by the PSAPs 722 and 724 in a "dip" (or request) process using a pseudo-automatic number identifier (pANI), which acts as a call identifier. The SCP 714 adds additional information to the ANI resulting in the pANI, which is particularly useful for a wireless application. For example, the additional information may include a cell basestation' s ID, longitude, latitude, etc. Finally, a PSAP, such as the PSAP 724 or 722, receives the cellular number, caller name, and caller location (e.g., as longitude/latitude). In an alternative embodiment, the 911 selective router 712 may perform the dip. Although some of the methods and apparatus of the present invention have been described with reference to GPS satellites, it will be appreciated that the teachings are equally applicable to positioning systems which utilize pseudolites or a combination of satellites and pseudolites. Pseudolites are ground based transmitters which broadcast a PN code (similar to a GPS signal) modulated on an L-band carrier signal, generally synchronized with GPS time. Each transmitter may be assigned a unique PN code so as to permit identification by a remote receiver. Pseudolites are useful in situations where GPS signals from an orbiting satellite might be unavailable, such as tunnels, mines, buildings or other enclosed areas. The term "satellite", as used herein, is intended to include pseudolite or equivalents of pseudolites, and the term GPS signals, as used herein, is intended to include GPS-like signals from pseudolites or equivalents of pseudolites. carrier frequencies, rather than utilizing different pseudorandom codes. The term "GPS" used herein includes such alternative satellite positioning systems, including the Russian Glonass system. In the foregoing specification, the invention has been described with reference to specific exemplary embodiments thereof. However, it will be evident that various modifications and changes may be made thereto without departing from the broader spirit and scope of the invention as set forth in the appended claims. The specification and drawings are, accordingly, to be regarded in an illustrative rather than a restrictive sense. 1. A mobile satellite positioning system (SPS) apparatus comprising: an input to receive information to indicate a position of said apparatus; and a data communication interface to provide information to indicate the position of said apparatus to an external device, which external device provides data based on said information to said apparatus via the Intemet. 2. The apparatus of claim 1 , wherein said external device is a server which provides said data through the World-Wide Web. 3. 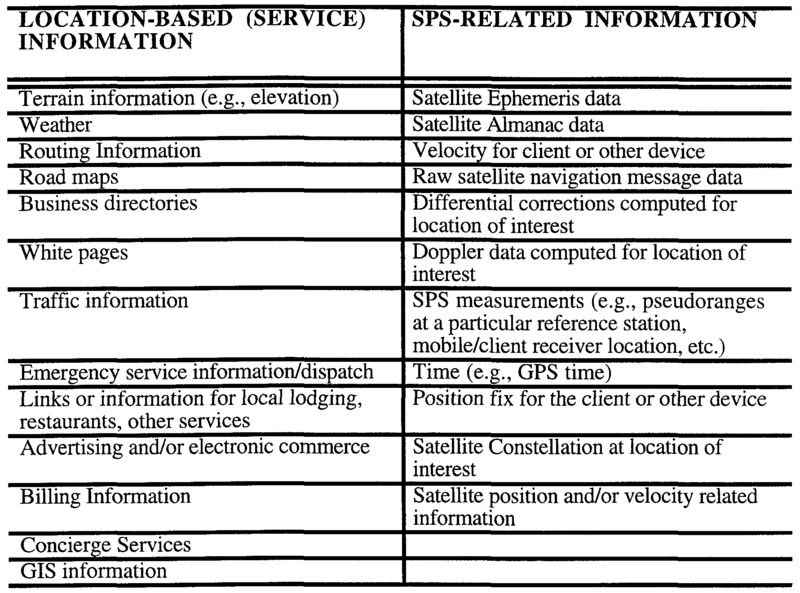 The apparatus of claim 2, wherein said server is coupled to at least one satellite reference station. 4. The apparatus of claim 1 , wherein said data comprises satellite ephemeris information. 5. The apparatus of claim 4, wherein said satellite ephemeris information is derived from at least one of a reference station comprising an SPS receiver and a wide area reference network (WARN) coupled to said external device. 6. The apparatus of claim 1 , wherein said data comprises at least one of a location correction information and time correction information. 7. The apparatus of claim 6, wherein said data is derived from at least one of a reference station comprising an SPS receiver and a wide area reference network (WARN) coupled to said external device. 9. The apparatus of claim 8, wherein said information is associated with pseudoranges. 10. The apparatus of claim 1, further comprising: a memory to store a routine for processing Web documents; and a processor to execute said routine. 11. The apparatus of claim 10, wherein said data communication interface is operable to provide a wireless interface to a World-Wide Web gateway. 12. The apparatus of claim 10, wherein said data communication interface is operable to provide hard-wired gateway to a World-Wide Web gateway. 13. The apparatus of claim 10, further comprising: a modem, coupled to said memory and processor. 14. A method for distributing information associated with a satellite positioning system (SPS), said method comprising: providing data associated with the location of a mobile SPS unit to a system in a network; and in response to said data, said system providing said mobile SPS unit via the Intemet information based on the location of said mobile SPS unit. 15. The method of claim 14, wherein said system comprises a World-Wide Web (WWW) server, and wherein said data associated with the location of said mobile SPS unit comprises one of: (a) pseudoranges; (b) digitized SPS signals; (c) a location approximation; (d) a position determined from a set of satellite signals received by said mobile SPS unit; and (e) velocity. 17. The method of claim 14, wherein said information comprises location- based service information derived from one or more databases having stored therein information related to the location of said mobile SPS unit or a location of interest. 18. The method of claim 14, further comprising: said mobile SPS unit determining a set of pseudoranges based on receiving a set of signals; and providing said pseudoranges as said data to said system. 19. The method of claim 14, wherein said information comprises ephemeris data derived from said system which includes a reference station having a SPS receiver. 20. The method of claim 14, wherein said information comprises almanac data derived from said system which includes a reference station having a SPS receiver. 21. The method of claim 14, wherein said information comprises correctional data based on said set of signals and derived from said system which includes a reference station having a SPS receiver. 22. The method of claim 14, wherein said information comprises location- based service information based on a geographical area associated with said mobile SPS unit. 24. The method of claim 23, wherein said data about the location of said mobile SPS receiver comprises a set of pseudoranges measured by said mobile SPS receiver. 25. The method of claim 23, wherein at least one of said data and said information is derived from at least a portion of a set of satellite messages. 26. The method of claim 23, wherein said digital processing system comprises a server coupled to an SPS reference station, which comprises an SPS receiver. 27. The method of claim 26, wherein said server is a World-Wide Web (WWW) server. 30. The method of claim 29, wherein said second set of data comprises information associated with a location of said mobile SPS receiver. 31. The method of claim 29, wherein said second set of data comprises at least a portion of one or more satellite messages received by said mobile SPS receiver. 32. The method of claim 29, further comprising: said Web server providing satellite ephemeris as part of said information. 33. The method of claim 29, wherein said information comprises location- based service information. 34. The method of claim 29, further comprising: said mobile SPS receiver, in response to said information, determining navigational information. 35. A system for providing location-based information to a mobile client device via the World-Wide Web, in response to receiving data to indicate the location of said mobile client device.